How to use the different skins for players and dinosaurs. What would a game that throws you onto a mysterious island populated with dangerous Dinosaurs be without skins? Skins in Ark: Survival Evolved are available for both humans and animals that you manage to tame. When applied, skins change the appearance of an item but don’t actually alter and of the stats. 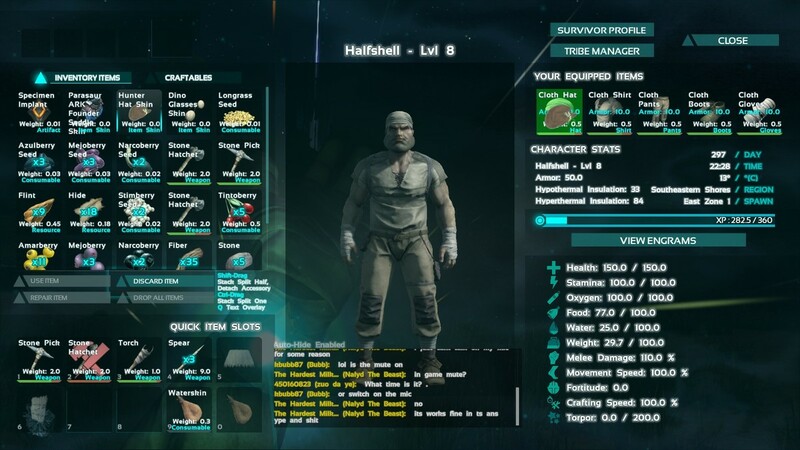 Skins are cosmetic items in Ark that allow you to change the appearance of an item without actually changing the stats. Skins can usually be used on any material, for example: most hat skins can be used on any grade of hat, be it made of cloth or hide. Skins are very easy to use. First you need to make sure you have the pre-requisite item equipped to your character/ creature. If you want to skin a hat, be wearing the hat, if it’s a saddle, the saddle must be equipped to the animal. After that open up your inventory, select the skin and drag it onto the item you wish to skin. If the item can be skinned it will light up green. Release the skin while it’s over the item and you will have successfully applied the skin! How do I Remove a Skin? Removing a skin from a saddle or other item is just as easy as applying it in the first place. All you need to do is hold Shift while clicking the skinned item, and then drag the skin back to your inventory. Skins can be reused again and again so long as you remember to remove them before the item they are applied to gets destroyed. How Do I Get Rid of a Skin Entirely? If you really hate a skin and want it nowhere near you have to destroy it. Skins cannot be dropped or exchanged with other players. For now skins can only be obtained from the developers for special events, like the founders saddle for be an early access purchaser. Other methods to gain skins such as through purchase or as drops are being worked on for later updates.